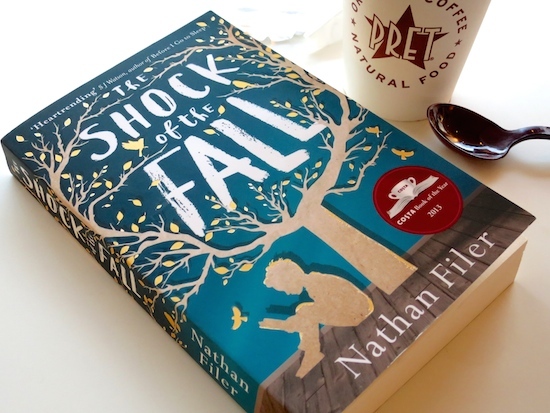 I haven’t been this excited by a book in a long time: Nathan Filer’s The Shock of the Fall is one of those novels that reaches out, grabs you firmly by both ears and refuses to let go until you’ve finished. I polished it off in just over twenty-four hours and I have to say that I feel somewhat exhausted by the whole experience; it’s a proper seesaw of emotional ups and downs and poignant moments. The novel tells the story of a man, Matthew Homes, and his spiral into mental illness. Actually I say man, but it’s difficult to categorise this character – he’s nineteen in the “present day” of the narrative, but he spends so much time in the past, reliving his childhood memories and recounting the events that he thinks shaped his future, that you often read his words as though they are the words of somebody much younger. I suppose this is what makes the whole novel such a colourful and busy experience – you never quite know who you’re dealing with. Matthew darts backwards and forwards in time, all the while holding onto his dark little secret and revealing little clues and pointers about things you’re not quite sure you want to find out about! Matthew is incredibly sharp and witty and keeps you on your toes the entire time – you never know whether you can fully trust what he’s coming out with and he’s actually quite open about the fact that he often remembers things incorrectly. At one point in the novel he gives three alternatives for what might have happened in a certain – quite significant – situation, but never confirms which of the options might have been the truth. It’s a clever device, really, because you experience first-hand the workings of his mind; unreliable, unpredictable, prone to sudden change. First person narratives often irk me; if the “voice” you’re hearing isn’t quite believable, staying with it for a full novel can be a bit like wading through treacle. Matthew Homes, though…by the end of the book you’re desperately hoping that there’ll be an endpage with details about the forthcoming sequel. (There isn’t.) His is not a voice you can tire of. Perhaps because it’s a voice of so many different people; it changes according to his mood or whether he’s on his medication or whether he’s making something up or whether he’s writing from the typewriter his grandmother has given him or the computer at his secure unit at the hospital. It is, as I said before, a voice that is colourful and vibrant and all of the words that you wouldn’t usually associate with a novel that deals with mental health issues. The themes in The Shock of the Fall are dark, yes, but the humour and the clever, detailed observations that run through the novel stop it from being depressing. It’s shocking, in places, but you can’t help but carry on reading. I most highly recommend.